The Defence Ministry has announced the appointment of Vice Admiral Karambir Singh as the next Navy Chief. He will succeed Admiral Sunil Lanba, who is retiring on 31st March. The government has once again broken the tradition of appointing the senior-most officer to lead the contingent forces by overlooking the seniority of Vice Admiral Bimal Verma. Earlier the government had appointed General Bipin Rawat as the Army Chief by overlooking the seniority. General Bipin Rawat had earlier superseded two officers to occupy the post of Army Chief. 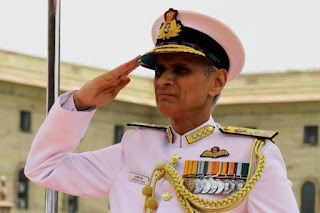 Vice Admiral Karambir Singh was born in 1959 and was commissioned to Navy in July 1980. In his long carrier of 37 years, he has served as the Fleet Operations Officer of the Western Fleet. He has served at Naval Headquarters as the Joint Director Naval Air Staff, and as Captain Air and Officer-in-Charge of the Naval Air Station at Mumbai. He has also served as a member of the Aircrew Instrument Rating and Categorisation Board (AIRCATS). He has commanded various ships, such as an Indian Coast Guard Ship Chandbibi, Missile Corvette INS Vijaydurg as well as two Guided Missile Destroyers INS Rana and INS Delhi. Vice Admiral Karambir Singh has been honoured with Ati Vishist Seva Medal and Param Vishist Seva Medal (2018) for his service. Q. Who will be apponited as the next Navy Chief?